See the Saint Michael Prayer and a Saint Michael coloring page below. Happy feast of St. Michael! St. Michael the archangel, defend us in battle.... See the Saint Michael Prayer below his coloring page. 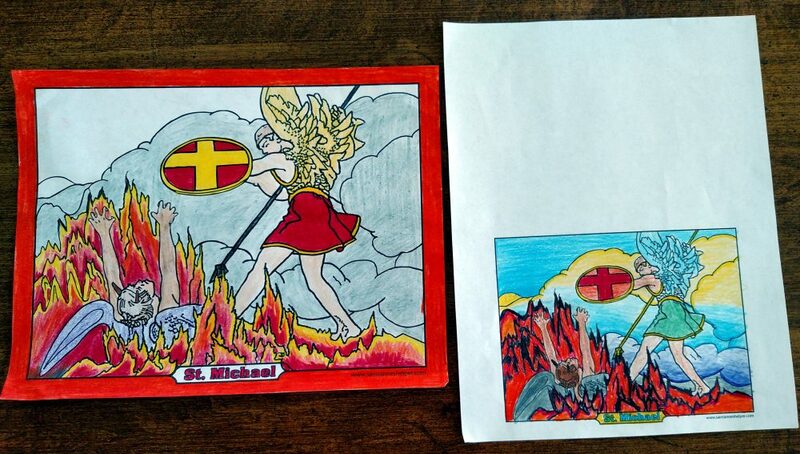 This coloring page has a picture of the Archangel Michael with sword and shield slaying the devil. This PDF prints 8.5x11" single sided. 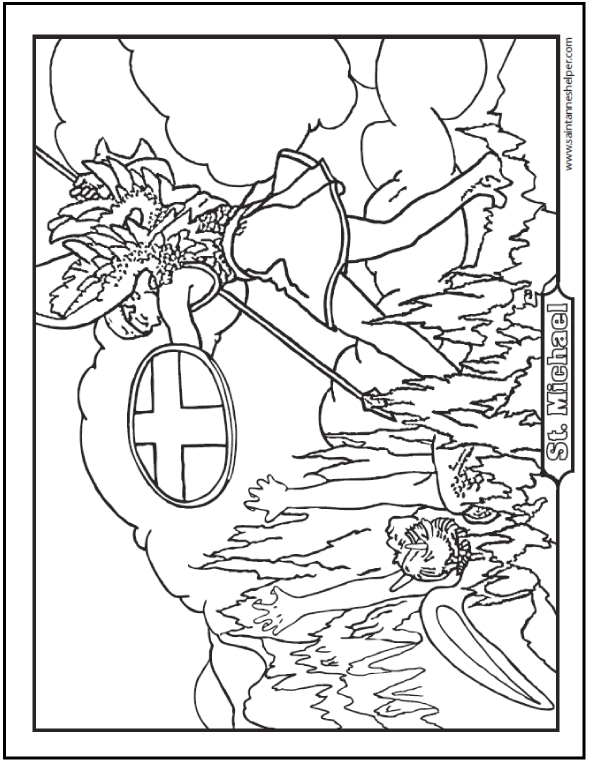 Honor Saint Michael with this coloring page on his feast days, September 29 and May 8, etc. Archangel Michael slaying the devil. Happy feast of St. Michael! Saint Michael the Archangel, defend us in battle, be our protection against the wickedness and snares of the devil. May God rebuke him we humbly pray; and do thou, O, Prince of the heavenly host cast into Hell Satan and all the evil spirits who prowl about the world seeking the ruin of souls. Amen. Sancte Michael Archangele, defende nos in praelio, contra nequitiam et insidias diaboli esto praesidium. Imperet illi Deus, supplices deprecamur: tuque, Princeps militiae coelestis, Satanam aliosque spiritus malignos, qui ad perditionem animarum pervagantur in mundo, divina virtute, in infernum detrude. Amen. St. Michael, the Archangel - Defender of the Church, patron of police. St. Raphael, the Archangel - Guided Tobias in the Old Testament story. According to the Catholic Encyclopedia, the name Michael means "Who is like God?" in Latin: "Quis ut Deus." His name is mentioned four times in the Bible: twice in the book of Daniel, once in the Epistle of St. Jude, and once in the Apocalypse. Monte Gargano - May 8, 663, apparition and victory of the Lombards (Italy) over the Greek Neapolitans. 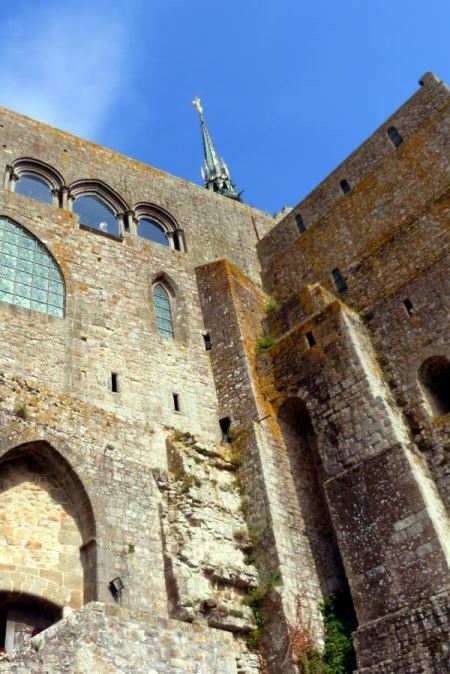 Normandy - Benedictine Monastery at Mont St. Michel. May 8: The Apparition of St. Michael. September 29: The Dedication of St. Michael the Archangel. Gold Statue of Saint Michael the Archangel on top of the Benedictine Monastery Chapel at Mont St. Michel, Normandy, France. Looking to the top of the Monastery on Mont St. Michel in Normandy, France you can see the gold statue of St. Michael at the top of the steeple. It is so beautiful!